Humans is the television series (based on a Swedish sci-fi drama called "Real Humans") which hit our small screens inially back in 2015. Its popularity has seen it return for 2 further series so far. Dramatically Series 2 and 3 have continued and extended the core concepts of Series 1, with a familiar human cast centred around the Hawkins family and a number of familiar and some new synth characters. One of the Series most notable visual characteristics is the fluidly economical yet slightly odd and robotic movements of the synth characters. 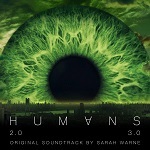 In Series 2 and 3 the programme makers have also upped the ante by adding more complexity around the purpose, intentions and motives of different synth groups (cunningly identified by eye colour, hence the album cover) and the individuality of particular synths with their very human-like needs and actions. Indeed beyond its outward sci-fi credentials the series continues to ask philosophical questions about life, consciousness and what it means to be human. From a music perspective, it seems that the onscreen world of "synths" (i.e. synthetic persons) is fittingly described by electronic "synths" (i.e. sound synthesisers) and other digital software instruments. Series 1 was scored by Cristobal Tapia de Veer "Cristo" a Chilean-born Canadian-based composer for film and television. He is perhaps best known for his music to the TV drama "Utopia" and among many other awards, he won a BAFTA in 2016 for his music to Channel 4's "National Treasure". While Cristo's title theme from Series 1 has been retained, Series 2 and 3 were scored by Sarah Warne. 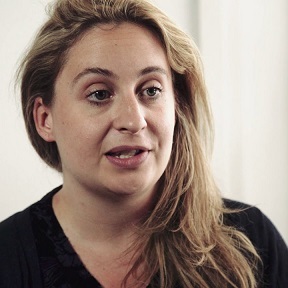 Sarah Warne is an experienced London-based composer in the same broad genres of film and television, with a sizeable portfolio of music scores and sound design work to her name. The composer's website is at www.SarahWarne.com. Warne has retained the electronic soundworld from Series 1 which makes the progression between the series virtually seemless. Many of the sounds and techniques may be the same as used on Electronic Dance Music, but this is pure dramatic underscore. At times the soundworld is clearly designed to suggest the presence of the "synths". Although some of the tracks could easily underscore any number of dramas, at key moments there is an auditory reminder of the synths' synthetic and slightly unsettling nature. At such times there can be a pulse sound which is partly electronic and partly organic, like a mechanical heartbeat with a liquidity suggesting (blue) fluids pumping through tubes rather than (red) blood flowing through veins. Although Series 2 and 3 have largely retained the soundworld of Series 1, there may be a barely perceptible move away from industrial type sounds toward more ambient layering. The other innovation in Series 2 and 3 is the relatively frequent but often brief reference to Cristo's main theme, which serves as a further auditory reminder of series' foundations (in case we were to forget that some of the characters are not all flesh and blood). 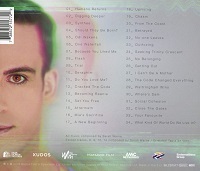 Some such tracks (8, 9, 10 and 14) but not all, are credited in the CD booklet to both Warne and de Veer. There are some other recurring sounds and motifs which give the album a certain unity, e.g. elements from "Digging Deeper" are heard again in "Set You Free" and "From the Coast". On many occasions these internal cross-references are not really thematic, but they do give a subtle feeling of consistency. Towards the end of the album Warne introduces some real instruments (or maybe samples of real instruments). "Waltringham Wins" seems to introduce a Cello towards the end of the track, and "Close the Gates" has a definite beat of Taiko Drums. "What Kind of World Do We Live In?" reflects the final enigmatic scenes of Series 3, no doubt setting things up nicely for a potential Series 4. A 4th Series has not been confirmed yet, but it is certainly in discussions. The Series 2&3 album is available on CD or to download from these links at Amazon.co.uk and Amazon.com. The Series 1 double album is also still available at Amazon.co.uk and Amazon.com.